1. Preheat the oven to 170˚C, gas mark 3. Put the nuts on a baking sheet and bake for 5 minutes, until light golden. Set aside to cool. 2. Meanwhile, lightly grease the base and sides of a 23cm springform cake tin with a little olive oil and line the base with baking parchment. Arrange the peach wedges on the base of the tin. Stir together the honey and lemon juice and pour over the peaches. Set aside. 3. Once the hazelnuts are completely cool, pulse in a food processor until finely ground. Put in a large bowl and mix in the polenta, baking powder, lemon zest and a good pinch of salt. 4. In another large bowl, whisk the eggs and sugar with electric beaters until light and fluffy (it should thicken quite a bit). Very slowly trickle in the oil (as if making mayonnaise), whisking as you go, until fully incorporated. Use a large metal spoon to fold in the nut mixture. 5. 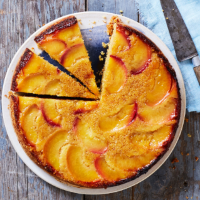 Spoon the batter over the peaches and bake for 1 hour, or until a skewer inserted into the centre of the cake comes out clean. Leave to cool in the tin, then turn out and serve with crème fraîche, if liked.